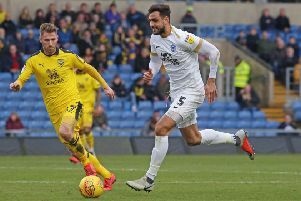 Peterborough United manager Grant McCann has no doubt which of three big games facing his side in the next eight days is the most important. McCann’s focus is entirely on beating Oldham in a League One match at the ABAX Stadium tomorrow (January 20). The Checkatrade Trophy quarter-final at Lincoln on Tuesday (January 23) and the FA Cup fourth round tie at home to Leicester (January 27) will not be allowed to become a distraction to a bid to keep in touch with League One’s top six. Recent Posh signing Joe Ward (right) with club captain Jack Baldwin (left) and Danny Lloyd. Posh are ninth ahead of the match against the Latics, but just three points outside the play-off places. New signings Joe Ward and George Cooper will both be in tomorrow’s matchday squad. Neither can play against Leicester, but Ward is eligible for the game at Lincoln. “It’s another big week for us which shows we must be doing something right,” McCann said. “But the Oldham game is the most important one for me. “It’s a cliche, but if you look too far ahead you get distracted. Our focus has to be on winning tomorrow to make sure we stay in and around the top six. “It’s been good to have no midweek game, but the players have still worked hard. We will be busy for the rest of the season so it’s important to keep on top of our fitness levels. “We have a lot of attacking options now. We have signed two players who are ready to step up to League One level in Joe and George. The players up top know they will have to be on it now as we have players ready to step in. “Our point at Wigan last weekend has been shown to be a very good one. Wigan made five changes to their starting line-up on Tuesday and still beat Bournemouth 3-0. We are also now in a position to make changes and keeping the side strong. Oldham top scorer Eoin Doyle, who netted twice against Posh in a 3-2 win in September, is ill and hasn’t played for several weeks. Posh midfielder Leo Da Silva Lopes is training again after suffering a hamstring injury 10 days ago, but tomorrow will come too soon for him.